We are pleased to offer for sale this lovely four bedroomed detached home, positioned within the prime Roman Way development. This is a delightful property which offers fantastic sized accommodation throughout. On the ground floor is a good sized entrance hall, cloakroom, kitchen with separate utility room, dining room, separate lounge with doors opening in to a lovely conservatory overlooking the large rear garden. Upstairs offers a light and airy landing, master bedroom with en suite shower room, three further bedrooms, plus a separate family bathroom. The rear garden is of a good size & is fully enclosed, with large patio area. To the front is a large driveway providing parking for numerous vehicles and a detached double garage. This property must be seen internally to fully appreciate. Utility Room - Side aspect double glazed window, further units and worksurfaces, sink and drainer, space and plumbing for washing machine and tumble dryer, wall mounted boiler installed in March 2018. Cloakroom - Front aspect double glazed window, low level WC, wash hand basin with tiled splash back, radiator. Dining Room - 10'1 x 9'10 (3.1m x 3.0m)- Rear aspect double glazed window, power points, coved ceiling. Conservatory - 19'0 x 9'7 (5.7m x 2.9m) - French doors and patio doors leading to rear garden. 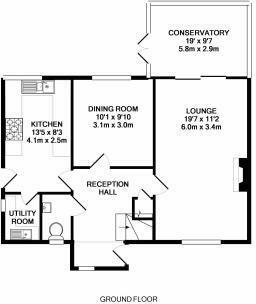 En-Suite - Side aspect double glazed window, low level WC, wash hand basin, shower cubicle, heated towel rail. Bedroom Two - 11'4 x 9'6 (3.4m x 2.9m) - Front aspect double glazed window, radiator. Bedroom Three - 11'4 x 9'6 (3.4m x 2.9m) - Rear aspect double glazed window, radiator. Bedroom Four- 8'7 x 6'9 (2.6m x 2.1m) - Rear aspect double glazed window, radiator. 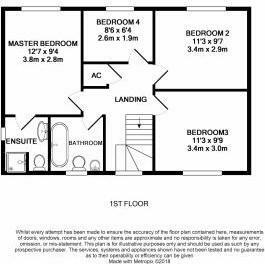 Family Bathroom Suite - Front aspect double glazed window, panel enclosed bath, low level WC, wash hand basin, radiator. Enclosed Rear Garden - Beautiful private garden, mainly laid to lawn with establish shrubs, generous patio area, fully enclosed by fencing. Front garden - Mainly laid to lawn with established trees and shrubs, gated access to the side. Large driveway providing parking for plenty of vehicles. Detached double garage with up and over doors and personal door into the rear garden. Disclaimer - Property reference JC. The information displayed about this property comprises a property advertisement. Rightmove.co.uk makes no warranty as to the accuracy or completeness of the advertisement or any linked or associated information, and Rightmove has no control over the content. This property advertisement does not constitute property particulars. The information is provided and maintained by Bourne Estates, Haverhill. Please contact the selling agent or developer directly to obtain any information which may be available under the terms of The Energy Performance of Buildings (Certificates and Inspections) (England and Wales) Regulations 2007 or the Home Report if in relation to a residential property in Scotland.